At some point, when things settle down, I’ll create a page dedicated to the TECAN machine and document all of the troubleshooting and tricks I’ve learned so far. Before that happens I have another mystery to solve. This first are some scans of BSA filtrates from my previous post on variable area sepcons. The two aberrative curves make no sense at all in the context of my other data. 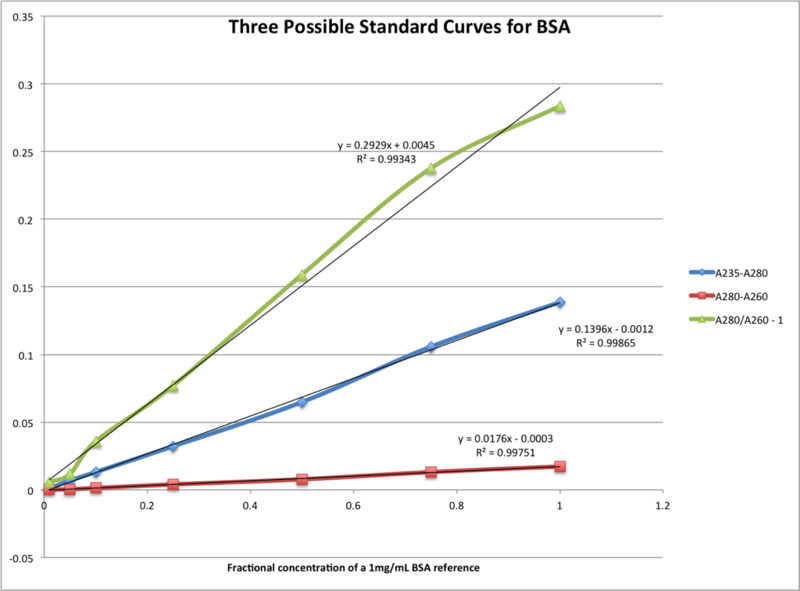 The mis-scans aren’t catastrophic – I saved my samples and I can re-measure, but I need a justification for excluding the original curves, and I don’t have one. Normally I would just keep normalizing using one of the ratios (a lot of the literature uses (A280/A260)-1, where A280 is the raw absorbance at 280nm), but the Barcikowski peptide concentration (and look out for a long post on those experiments soon) can only be measured using raw absorbance (both because that’s what the Barcikowski group uses and because our sodium phosphate buffer increases the absorbance at 235nm). I need to figure out what is driving these aberrative curves. It does NOT seem like a bum window in the Nanoquant plate causing the problems – in the first weird graph, the oddball scans came from window E1 and window C1, in the second the odd scan came from F2. This is probably a different problem, but I can’t be sure. First of all, these were all measured using the Quartz cuvette in the TECAN, as opposed to the Nanoquant plate used for the other experiments. The TECAN isn’t designed to hold those particular type of quartz cuvettes, but we discovered that if you are very ginger, it’s possible to keep the cuvette from inserting into the slot fully so that the quartz window matches up with laser aperture. We had to take this approach because normal plastic cuvettes (which don’t have a small window that needs to match up with the aperture) absorb in the UV range, so we can’t use them. Most of the data is lovely (and as of right now it is the only way we can measure the barcikowski peptide, since the nanoquant plate doesn’t have a path length long enough to read it), so we think this method is acceptable until we can get some quartz cuvettes designed for the TECAN. It’s very obvious when the aperture and window aren’t aligned – the absorbance tops out at three across the whole spectrum, so it’s unlikely that that is happening here. Also, whenever I got a weird curve I immediately ran the sample again (without adjusting the height of the cuvette. Note that it’s not possible to keep the cuvette in the machine after a scan – the machine always ‘ejects’ the little cuvette holder, but you can immediately get the arm to retract without the height of the cuvette changing), and the weird curve was not repeated. My methods of cleaning are as follows. The plate is cleaned by dipping repeatedly into the bath sonicator for ~20 seconds. Afterwards it is sprayed with 70% ethanol and wiped with a Kimwipe. 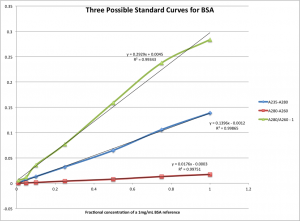 BSA solutions of 3uL are loaded using standard pipette tips. I always check the top and bottom of the plate to be sure that no liquid (ethanol or water) clings to the outside of the windows. I close the plate as soon as it is loaded and try to run the sample within a few minutes of loading. The cuvette is washed with water, then 0.01M HCl, then water, then 0.01M KOH, then water. At one point I worried that small amounts of water were causing the Barcikowski peptide to denature or something (it was late and I was tired), so for the 10nm separations I replaced the water washes with sodium phosphate buffer washes – this had no effect. The cuvette is then loaded with between 50 and 70 microliters of sample and gingerly inserted into the cuvette arm on the TECAN so that the little quartz window aligns with the laser aperture. Non-physical results are almost always technique related, as much as you would like to blame the machine. For the nanoquant plate, the difference is so large that there must be a bubble or something in the optical path other than just pure sample. When the 2 plates come together the fluid path must be perfect between the two quartz windows at each position. Have you tried putting the same sample in every position and seeing how much variability you see? You may want to adjust volumes and other variables until you can get the same result every time. Have you looked at the positions with the poor scans after taking the plate out? You can probably see a problem by eye, given the difference in apparent absorption. The cuvette not being correct for the Tecan is probably the issue with the last set of scans. It’s not just important that the light goes through the window, but it must go through the same position in the window at exactly the same angle. Any scans that are way off are likely hitting the edge of the front or back window. I wouldn’t worry about it too much until you get the correct cuvettes.